Khadim Ali, an artist from the Hazara community from Central Afghanistan, is currently based in Sydney. He trained in contemporary miniature painting at the prestigious National College of Art, Lahore, Pakistan, and in mural painting and calligraphy at Tehran University, Iran. In his own words: "My style of painting is very much inspired by two great schools, Indian Mughal painting and the 15th/16th century Persian artist Razai Abbasi Isfahani". This drawing contains an image of one of the two monumental 6th century Bamiyan buddhas destroyed by the Taliban in 2001. The Buddhas were in Khadim Ali’s home province of Hazarajat. Apart from these emotive images, his work also incorporates images of a demon. 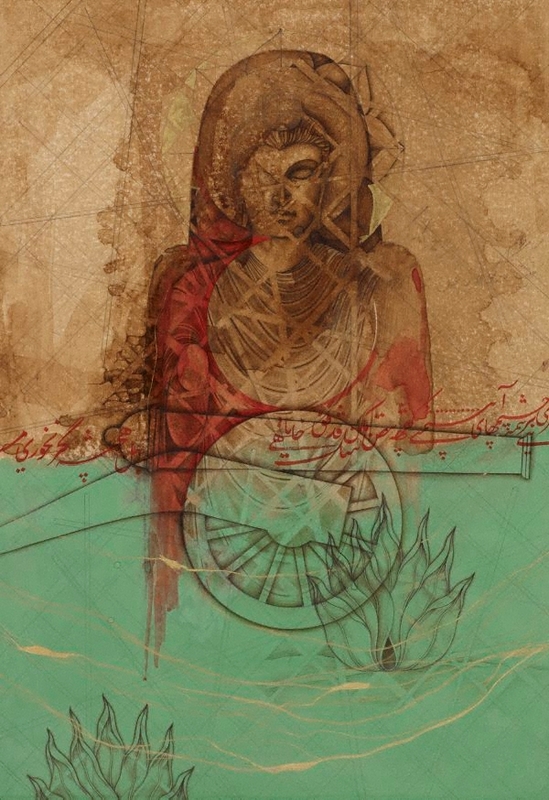 In his words "The demon I paint is a fusion of my own created elements with characters from the 11th century secular book by Abul Qasim Firdausi, the 'Shahnama', written at Mahmoud Ghaznavi’s court in Ghazni, Afghanistan". The hero of the 'Shahnama' is Rustam, known to generations of Afghani children. The gilded lettering on the work is meaningless, his commentary on how gilded words with perverted meanings have seduced more and more people in his region towards religious fundamentalism. As he says ‘The true value of words and ideas is lost to the demons’. The lattice work surrounding the Buddhas alludes to the bamboo structure surrounding the buddhas as part of a UNESCO project to rebuild them. This work is the start of a newer series. Some of the text on it is by his writer friend Asad Budah, the most well known writer in Afghanistan and Iran who also invented the term ‘The haunted lotus’ in reference to the Bamiyan buddhas and what they symbolise.